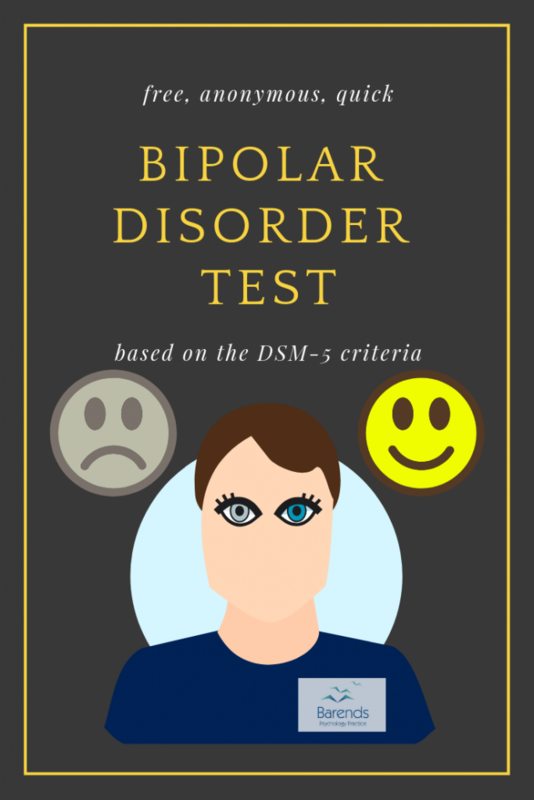 This bipolar disorder test focuses on both manic and depressive episodes. The depression symptoms contradict the manic symptoms and vice versa, and that is why this online bipolar disorder test separated both the manic and depressive episode. Based on the scored obtained in both episode types, you’ll get a detailed explanation about the test results and a recommendation for further steps. In case you doubt the results of the bipolar disorder test, feel free to retake the test or to send us a message. We typically respond within 36 hours. This test can also be taken for a friend or relative if you are concerned about someone’s wellbeing. Be aware that this test cannot be used for diagnostic purposes. This bipolar disorder test only gives an indication based on your answers. Important: For your information, the plugin used for this questionnaire only registers how many times the test has been viewed and taken. It does not register your IP address or asks for your name, email or anything else. Bipolar disorder symptoms, risk factors, and facts. Bipolar disorder causes, diagnosis, and treatment. Online therapy for bipolar disorder. At Barends Psychology Practice, bipolar disorder treatment is being offered (also online). Contact us to schedule a first, free of charge, first session. (Depending on your health insurance, treatment may be reimbursed). I experienced a distinct period of abnormally and persistently elevated, expansive, or irritable mood, and/or increased goal-directed activity or energy, nearly every day. Yes, less than 4 days. Yes, between 4 and 6 days. Yes, more than 6 days. Yes, and I got hospitalised. Excess pleasure or risk activity (doing things that often have disastrous consequences like spending a lot of money). I was able to function normally (like any other day). I had hallucinations and/or delusions (seeing or hearing things that are not real). I received somatic antidepressant therapy. I took medication that have the above mentioned side-effects. I used drugs (during or right before the episode started). (Advertisement. For more information about bipolar disorder, continue reading). Bipolar disorder test – why is bipolar disorder so confusing? Bipolar disorder is a complicated mental disorder to understand and to diagnose, because of the sometimes contradicting symptoms of mania and depression, and the confusing criteria for bipolar disorder I and II. For instance, to meet the criteria for bipolar disorder I, a manic or mixed episode is required. A mixed episode is both a manic and depressive episode lasting for one week. To meet the criteria for bipolar disorder II a hypomanic episode and a depressive episode is required. A hypomanic episode is almost similar to a manic episode but lasts shorter and does not cause functional impairment. In other words, both bipolar disorder types look very much alike. One important criterion to keep in mind focuses on whether the symptoms cause someone to function poorly at work or during daily tasks. If this is the case, it is always strongly recommended to reach out to a mental health professional for further steps. If this is not the case, it is not (yet) urgent to contact a mental health professional. Please note: when someone experiences a manic or hypomanic episode, they can feel like they can conquer the world, like they can create and do anything they want. These individuals usually do not take the bipolar disorder test or reach out to a mental health professional. However, if you have the feeling your friend experiences a hypomanic or manic episode, you can also take the test for this person to get an indication about the way he or she functions.